With the ambiguity of the underground's legendary 'Dogs must be carried' notice in mind, I was amused to see this sign in the courtyard of the Royal Academy, London, the other day. 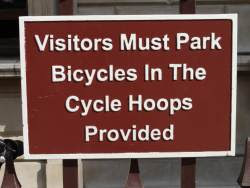 What about visitors who don't have bikes? 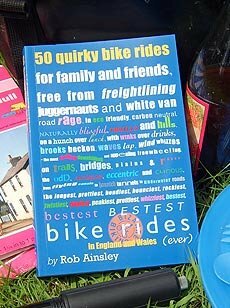 Perhaps a Barclays Hire Bike will do? 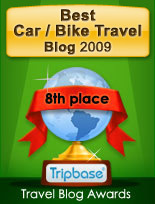 http://www.cyclestreets.net/location/12980/ - trust me to miss the obvious joke. Oh well. I saw a notice in the bathroom in this Chilean hostel: 'Shower until 23.00'. Cripes, I thought,it's only 8am, surely the hot water will run out. And I'm not sure we'll all fit in.